Diablo 3 Barbarian Speed Farming Guide - No Crazy Gear! There's some new tricks to make this process less painful than it used to be. Witch Doctors are spell casters in Diablo 3 that focus on shamanistic and necromancer style magic. They are able to commune with spirits and nature alike and their abilities reflect this. They can summon zombies, rats, dogs, toads, bats, and worse. Witch Doctors tend to focus on poison and fire in their abilities, but have other elemental damage as well. Many of their skills focus on controlling the pace of battle and inflicting damage over time to their enemies. They control the pace of battle through fears, slows, walls, and by using various summoned pets and minions. Often times they kill their opponents through long lasting debuffs and damage over time abilities. Witch Doctors offer a variety of play styles that range from playing a puppet master for your various minions, to a ranged caster, to an in close and in your face damage style. They really have something for everyone. In Diablo III the Witch Doctor class uses a resource called Mana. This resource is a spiritual energy from the Unformed Land where spirits dwell and is used to power many of the witch doctors abilities. Mana regenerates slowly for witch doctors though so a large part of playing the class is managing the use of it and timing abilities to match when you will have enough. Witch Doctors also have several abilities that can return mana more quickly such as Poison Darts with the Spined Dart rune, Corpse Spiders with the Widowmaker rune, or Plague of Toads with the Toad Affinity Rune. Some of the witch doctors abilities do not require mana an instead are based on longer term cooldowns. They also have several skills that bring minions into play that can continue to deal damage even while you are not casting. As with all Diablo III classes there is a strong theme to the armour that you will find for the class and an overall progression in the appearance. For the Witch Doctor that progression illustrates their journey from novice to master with a very visual flair. When a Witch Doctor starts out they have little in the way to protect them selves other than their knowledge and tatoos. As they advance they start to collect more protective armour and their signature masks start to take form. Once they reach maximum level they will be decked out in primal looking outfits that are designed to instill fear in their enemies. They will have many additional plates of armour for protection as well as a complete tribal mask with tusks, horns, skulls, and more. Primary Skills – These skills are your basic skills and also count as "signature" skills, making them free to cast. While not as powerful as some of your other skills, they offer a way to keep dealing damage at all times, even when out of mana. The skills included here are: poison darts, corpse spiders, plague of toads, and firebomb. Secondary Skills – These are more powerful attacks that combine with your primary skills to form your basic rotation. These all consume mana though, so are only used when you have enough mana and all of your more powerful spells and skills are on cooldown. The skills here include: grasp of the dead, firebats, haunt, and locust swarm. Defensive Skills – These skills are all grouped as defensive skills but really provide a lot of variety. They are summon zombie dogs, horrify, spirit walk, and hex. Between these they offer minions to help protect you, a fear, an escape, and a voodoo doll that turns enemies into chickens. Terror – These abilities all use the power of terror to your benefit. They can draw power in to you, make your undead constructions explode, or confuse all enemies around you. Decay – These abilities are some of your strongest attacks and are mainly poison based as they aim to decay your opponents. The abilities here include zombie charger, spirit barrage, acid cloud,wall of zombies, and piranhas. Voodoo – These are various high damage long cool down abilities. They are some of your best abilities but due to their long cooldowns can not be used very often. They include the ability to summon a huge undead creation called a gargantuan, a powerful buff for you and your party in the form of big bad voodoo, or summon a fetish army from the spirit world. Detailed ability listings can be found in the Diablo III Skill Calculator. When gearing up any character in Diablo III there are multiple different paths that you can take. For the Witch Doctor those choices are basically aiming for maximum damage output or maximum survivability. * Crit Damage is best kept in a ratio with Crit Chance. For every 1% point of Crit Chance you gain you should look to add about 10% Crit Damage. This is relatively easy to get through a gemmed weapon. * Resistances are just as good as armour, but you need to make sure they are valid. +Resist All is pretty much the same as armour, but stacking just a single resist needs to be considered as far less valuable. While the above are the ideal paths for max damage or survivability, as a matter of necessity you will really need to balance the two different directions. After all killing everything quickly but dying to a single hit is not very useful, just as being able to live forever but taking 5 minutes to kill a single normal enemy monster is not useful. Therefore keep both in mind and balance between them to best suit your style of play. Max Mana - This boosts your maximum mana pool. Mana Regen - This helps regenerate mana over time, allowing you to cast more spells more often. Witch Doctor Skill Bonuses - These boost several Witch Doctor skills by a percentage amount. Most are between 10 and 20%. It is important to note that they are not calculated into your damage rating and therefore gear may appear to have lower damage output, but if it is an ability you use all the time, it may actually be an upgrade. While levelling the main aim with any class is to kill enemies fast so that you can keep moving and earning more experience. From levels 1-20 can be done by grabbing pretty much any skills you like as you get them. However by level 30 and if you are playing higher than normal difficulty you will probably want to switch to something that allows you to stay alive while killing enemies quickly. Witch Doctors offer a number of great leveling builds, but one that offers amazing survivability is one that focuses on pets and escapes. It allows you to sit back, deal a little damage, while your pets take most of the incoming attacks, and escape whenever you need. An example of this type of build can be found below. 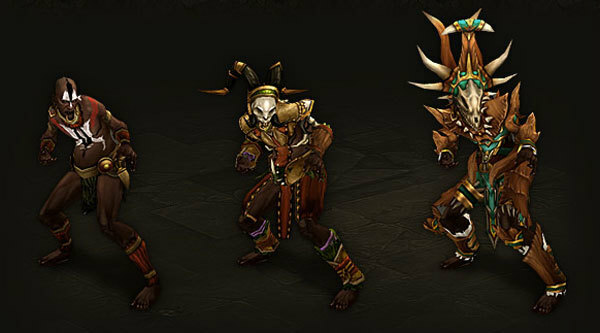 You can find more details on the individual skills here: Diablo III - Witch Doctor Leveling Build. There are many different builds that you can use once you reach max level on your Witch Doctor. These include poison based kiting builds, pet builds, and more. While pets are amazing while leveling, they tend to be a little less effective once you are at max level and into the torment difficulties. They still have their place, especially when running solo, however since most of the time you will be with a group online I suggest something a little more damage based. This is a solid damage based build that still has a few escape and control abilities so that you will not die all the time. You can find more details on the individual skills here: Diablo III - Witch Doctor Level 70 Build. With this build you are counting on others to hold enemies away from you most of the time, and can help to do that as well with your Grasp of the Dead. Keep your vision quest buff active with your darts, and hit enemies with firebats until you need to refresh. Anytime enemies do get close use your soul harvest to boost your damage and then escape with spirit walk. You should also keep hex up all the time for healing and some control.